Not everyone is into landscape design, but we can all tell when someone spends time taking care of their lawn because of their lush green grass with accents of flowers and beautiful trees. Landscaping seems to be simple, but not all lawns are proof of that. As simple as it may seem, there is a lot to learn to get a perfect lawn. Below are some ways to help you restore your landscape and have a beautiful lawn you can be proud of. 1. Get rid of dry patches: it is virtually impossible to make your entire lawn colorful and lush. Unfortunately, dry patches in your lawn and dead flowers immediately draw attention and distract from the other landscaping. It is best to replace the dry areas with healthy grass or plants to improve the look of your lawn instantly. This is an easy form of landscape restoration that anyone can do. 2. Create a focal point: when you create a focal point in your yard, it becomes more interesting and will draw attention to itself. Choose a specific plant or statue to make the focal point, then create the rest of your design to draw focus to this point. 3. Add interest with landscape movements: bring life and interest into your landscape with movement. This can be done with flowers that attract animals or swaying plants. Bringing movement and activity to your landscape design can improve your yard more than you would expect. In The Woodlands, TX, plants that attract hummingbirds are a great idea. 4. Plant in the right spot: before planting anything, it is important to know the optimal amount of water and sunlight the plant needs, as well as its growth rate, needed space, and full-grown size. This will help you ensure that your landscape design will thrive throughout the years. 5. Mowing at the right height: mowing your grass to the best height is a topic that is widely disputed. When you cut your lawn short, the grass is stressed out too much. It is best to keep your lawn healthy by raising the mower to a higher setting and only cutting a third of the grass length. This will help prevent weeds and help the grass develop better roots. Your local landscaping company should follow the same guidelines. 6. Using fertilizers: if you want to grow a strong lawn, fertilizer is necessary. Try to find a fertilizer that includes micronutrients to give your lawn what it needs to stay healthy. Fertilizers act like multivitamins for humans. In Tomball, TX, the soil requires regular fertilization and lime every few years to keep the soil pH levels balanced. By using the tips above, your lawn can look green and lush and be the envy of the neighborhood. Simply remember to get rid of any dry patches, create a focal point, add interest with landscape movements, plant in the right spot, mow your grass at the right height, and use fertilizers as recommended. If you need further help with your lawn, talk with your local professionals. Dealing with flooding in your yard can be a nuisance. When your grass is underwater for an extended length of time, it will die. You are unable to mow areas that are wet, and mud is tracked into your home. What are some options for you to consider? We will cover some basic steps you can take below. One of the first steps to help you with your flooding dilemma is creating a drainage plan. Make a basic sketch of your property that shows features such as your house, yard, patios, driveway, and street. Use a level to determine the low and high spots. Draw arrows to mark how the water flows. This can help you come up with a good strategy for your situation. A creek bed is a great way to channel water away from low spots or to steer the rain into a dry well or garden. A landscaping company can help you build a creek bed that looks nice even without water. Building a dry creek bed can help you create a drainage system and add an attractive feature to your landscaping. As you build the creek bed, keep low spots in your yard in consideration so you can direct water away from them. If the low spot generally collects water, a creek bed can drain the water away. To build a dry creek bed, dig out a shallow drainage ditch with a gradual slope. Use stones or gravel to line the ditch. You can use plants, boulders, or other designs to decorate during the drainage system installation. It isn’t necessary to create a creek bed for your drainage project, though. You can design a simple swale to subtly control the water. It is best to do this before seeding your yard, but you can simply replant grass once the digging is done if necessary. If there are low spots on your property that tend to hold water, a rain garden may be a great consideration. Rain gardens are fairly common in The Woodlands, TX. These are simply areas in your yard that are designed to hold water and contain plants that love water. These gardens not only look better than muddy holes in your yard, but they are good for the environment because they reduce runoff. It isn’t necessary to build a rain garden that holds water like a pond. A rain garden can simply hold excess water until it can drain away. The main consideration in designing a rain garden is choosing the best plants for your soil. In Tomball, TX, we choose native plants with deep roots that do well in our conditions. As you can see, there are several options for anyone dealing with yard flooding. To ensure your flooding problems are dealt with effectively, discuss your issues with professionals. They can help you determine how to best deal with your situation. Sometimes a landscape that is a little different from the others is a good thing. Maybe everyone pretty much has the same front yard or it just has grass and a few shrubs. You want to attract attention a little bit, have something more exciting or unique in your landscaping so you stand out from the rest. Our Tomball, TX landscaping company can provide you with the unique landscaping that you desire! One kind of unique feature would be to have a rock garden instead of mulch. Rocks come in all kinds of colors and can be used in the same way mulch does, around trees or shrubs. This kind of landscaping works well in an area that's hard to reach, or on a slant, or needs good drainage. Weeds are at a minimum, and it can add a pop of color to an area. Our landscape designers can help you decide the best look for any area. Another option is to use native plants instead of grass in certain parts of your yard. Native plants may not be the most commonly found in garden centers sometimes but can have a nice impact in your yard. Native plants are acclimated to the climate and survive without needing as much care as plants that do not grow naturally around here. Native plants can offer a lot of foliage colors and variations that can greatly enhance your lawn. A retaining wall is also a way to add a unique feature to your yard. If your yard naturally slopes, then retaining walls can be used to shore up areas of your yard to make them flatter, or to add layers to your yard that look very interesting from the street. Retaining walls can also have planters built into them, to add even more interest. Using unusual containers for your plantings can add a lot of creativity to a yard. Overturned wooden barrels can be made to look like flowers are flowing from them. Old wheelbarrows and troughs can have plantings in them. Even old, large watering cans are a clever way to add flowers with some added interest. Pergolas, shade structures, and arbors add a structural element to your yard. Our designers can help you come up with a structure that meets your needs, provides shade, and fits your patio or deck area. These structures can have ivy or flowering vines that grow up the side, planters or lanterns that hang or lighting around the structure. There are many possibilities! Adding walkways and paths throughout your yard and garden can add a unique touch. Flat stones with moss growing in between are an interesting look, and stone edges can create borders that look like they belong there. Planters can be built into different areas of your yard to add drama. Having unique landscape areas in your yard can be a lovely way to stand out from the crowd, add interest to your home, and elevate your look among your neighbors. 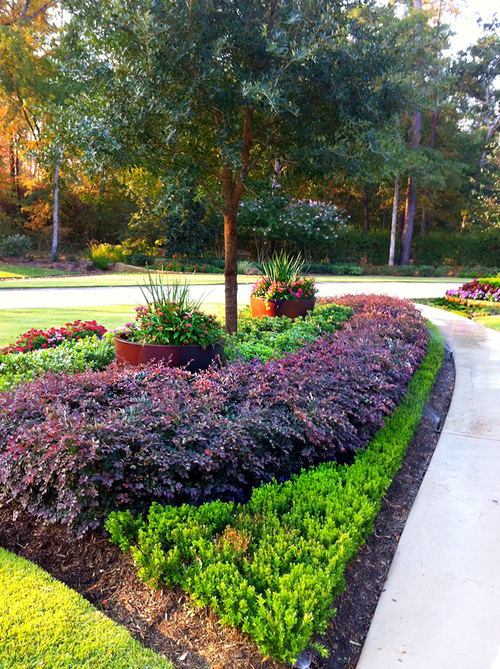 We are a premier landscaping company in Tomball, TX area. Our landscape designers can create a unique and customized look for your yard today. There are many ways that walkways can enhance the look of the landscaping around your home. Walkways can be both functional and decorative, and there are many options on how you want them to look. Walkways break up the expanse of grass, create paths from one location to another, and provide a safe way to walk across your lawn without damaging the grass. So what kind of walkways can our landscapers use to enhance your home? Walkways can be almost any kind of material, size, color, or shape that you can imagine. Our landscaping company can work with you to create the perfect walkways and paths to enhance your home, connect various locations in your backyard, or provide a path from the back to the front of your home. - Do you want a full path or a series or stones or pavers set in the grass? - What kind of material would you like? Tinted concrete, smooth or stamped concrete, bricks, stones, there are many options! - Consider size, shape, and decorative elements like built-in lighting. Creating a walkway to your garden or vegetable beds will have many benefits. You will be able to walk back and forth to your garden without damaging your grass, especially nice when it has been raining. Having a walkway allows you to bring your wheelbarrow or garden wagon out to your vegetable garden or over to your flowers without going across the lawn. Stepping stones around your flower gardens are lovely and provide support while you tend to your flowers. Fire pits are great ways to socialize with friends, enjoy the evening hours, and allowing enjoyment of your outside spaces as it gets cooler outside. If you want natural grass throughout the area, consider placing walkways or stepping stones to and around your fire pit. Walkways can also have lighting installed, so you have gentle illumination to walk safely. Walkways to and from your pool are important, they provide safety and a way to travel without damaging wet grass. Our landscape designers will work with you to ensure that your pathways are made of the right materials, they won't be slippery when they are wet, and they hold up to the chemicals that might be used with your pool system. Walkways around your patio or outdoor living area can provide a lot of aesthetic value to your home. You can create ambient lighting, curved paths, and have borders for planters and flowers. Walkways are a way to enhance your landscaping and can accentuate decorative gardens or fountains. 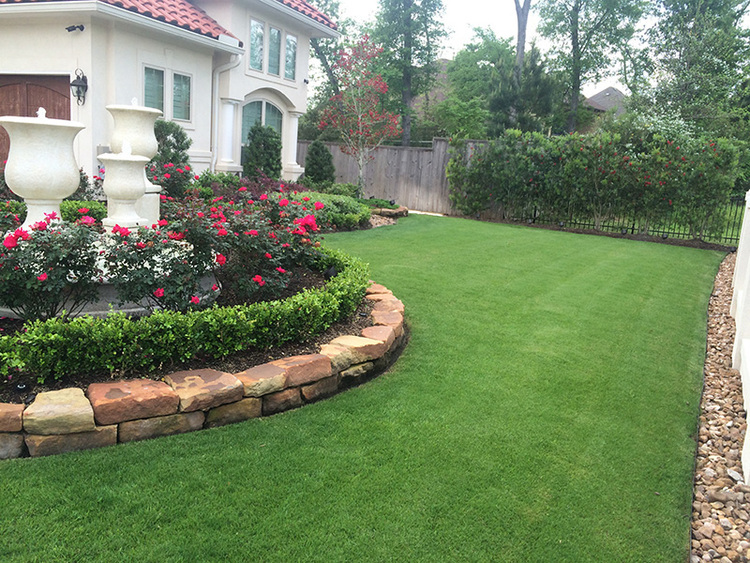 We are the premier landscaping company in Tomball, TX. Our landscaping company can design the walkways that will enhance your home and backyard. Whether you need walkways from the front through your backyard fence, curved stepping stones throughout your gardens, or non-slip surfaces near your pools or fountains. Our landscape designers will work with you to design walkways that will naturally enhance the beauty of your home. Landscape lighting alters the look and safety of your home during the nighttime. When you hire a professional landscaping company to install landscape lighting on your property, these landscapers assist you in searching the various outdoor lighting fixtures and offer the inspiration and information you need to enhance the curb appeal of your home. Pick the type of landscape lighting that gives you what you’re looking for, or you can mix and match to completely light up your yard. LED landscape lighting is the top choice for homeowners seeking landscape lighting that is energy efficiency and simple maintenance. Path lights - the most common type of landscape lighting. Typically, path lights are used to line a flower bed, walkway, or other hard-to-see areas, bringing ambiance and safety. Spotlights and Floodlights – a friend of mine who provides landscape service in The Woodlands, TX says that if you want to bring security to your yard, as well as highlight your hedges and shrubs, spotlights and floodlights are the way to go. Deck lights – good to keep you safe when walking on your deck/deck stairs at night. Well lights –showcase your neatly trimmed trees or flower beds by putting well lights around the base of your trees or your flower beds. Post cap lights – for visual appeal and safety, put post cap lights at the top of your deck posts. Solar lighting has become an affordable and trendy way to light up your yard. Without electricity or wiring, you can put solar lighting anywhere you want. Solar lighting operates utilizing a solar collection panel that draws energy from sunlight and changes it into electrical power that's put in highly effective rechargeable batteries. As the sun goes down, the solar lights come on. In perfect situations, solar lights that are at full power stay on for about 15 hours. LED solar lights give off white, bright lighting. Nonetheless, solar-powered lighting needs a good amount of sunlight so the batteries can charge up. Solar lighting performance is contingent on the amount of sunlight obtained during the day. As homeowners, you work hard to pick distinctive trees, plants, flowers, and shrubs to make the perimeter of your residence and landscape stunning. However, there is one facet of landscaping that is continuously overlooked. When it’s nighttime, without accurately selected and installed landscape lighting, your marvelous planned landscape design vanishes. If you want to make the most of your landscaping investment, choose wisely landscape lighting that brings beauty to your evening time curb appeal. You need to figure out what is the outcome you want with landscape lighting, regardless if it is to illuminate your deck, walkways, and patios or to improve your home’s security. Creating objectives for your landscape lighting lets you think outside of the box with your landscape lighting design plans and also guarantees you have all your basic elements covered.